"It's the best of the best....."
Can't decide? Keep thinking about it and I'll let you know later. In the meantime, this post is about the best of the best! Today I have a new list and it's all about the favorites in my classroom- from my point of view! So, here's my top FIVE best STEM Challenges and reasons I love them the most! "What do these two measures have to do with one another? Is one affected by the other?" The boxes we use as models and for measuring are all cereal boxes. After delving into the history and marketing of cereal it turns out the cereal box is like a little advertising billboard for the product. "Create a cereal and its box. Using a piece of poster board make your own box, with the goal of having the largest possible volume." Every group has the same size poster board. You might think that all the boxes will be the same....nope! This Mystery Build is number 2 on my list! I love the way it turned out! My idea was to have kids all build the same thing, but with different materials OR have the same materials and build something different. I tried both of those ideas, but was not happy with the waste of materials and finally settled on a great plan. Every team builds something different. They all have the same materials from which to choose, but they choose what they think they will need based on their ideas and what they are building. To make it even trickier, they have a budget and must purchase the materials! This is such a crazy good challenge for so many reasons. "Okay, I do think we need craft sticks, but not as many as you think. And I think we need three feet of tape, so let's try this. Let's get 5 craft sticks and 2 feet of tape. That will cost less and we get both things." Coming in at number 3 for me is Pipelines. This is the easiest challenge ever- with paper and tape as the only materials. It's the background story that makes this so fabulous. We researched the country of Panama and talked extensively about how remote villages get water. It seems that many of them get water from a centrally located tank that drains water through piping systems to collection areas. The villagers must carry jugs or buckets on a trek to the collection pipe and fill their containers with water to take back home. This is a daily chore. The main problem is not just the journey to get the water, but the fact that the water is often contaminated by the faulty pipe system. I found images online of pipes and drainage systems that were quite startling to my students. They, of course, think the source of all water is the tap in their kitchens or bathrooms. It has never occurred to them that water is not sent to people like this all over the world. This challenge was eye-opening for my fifth graders. The design challenge was to work as a charitable organization with a plan to create a safe pipe system for remote villages. Each group built a model of their pipeline to present to the charity hoping it will be adopted. The goal of making better piping systems for disadvantaged communities is the focus. Kids had specific design constraints for their pipelines. The demo of their systems did not use real water! We made a ping pong ball travel through the pipe system! I love this challenge! The Same Supplies 2 Tasks challenge was born during the trials I had with thinking about mystery builds. In this type of challenge two groups work together as one team. Each group gets the same materials, but each builds something different. When the two separate devices are completed the two things are joined together. The two groups within the team must work together. I had no idea how this would work, but it was spectacular. The two smaller groups conferred and kept talking as each separate part was being built. They measured together and made sure pieces fit together. They tried out preliminary parts of the devices to make sure they would work together. It was awesome! We tried three different versions of this format, but my favorite was the rescue challenge. Teams had to build a platform and the cranking device that would raise the platform from the ground to a three-foot height. The scenario was that the teams had to rescue a friend that has fallen off a cliff-side. I love this challenge purely for the teamwork I saw as kids completed it! Oh, my, did we all love this one, but me especially. I have really enjoyed working with experiment and design challenges. I like having students experiment, control variables, and keep data tables. Then we use the data to make scientific decisions about what to build. In the ramp challenge, we tested the angle of ramps to decide which one gave the greatest distance and also the smoothest ride. Then kids built their own ramp and placed it at an angle to create the longest distance for their little cars. This produced so many extra design opportunities. Kids wanted side rails on their ramps, the transition from the ramp to the floor was a problem, some wanted free-standing ramps, and some cars just would not stay upright. So many things to consider, but it was amazing to see. We stopped often to talk about why results were not what we expected and what could be going wrong. Total fun and all you need is a lot of cardboard and a bunch of little matching cars! Alright, STEM Friends, that gives you a little more information about my favorite STEM challenges. How does this compare to the choices students made? Their choices and mine are all different! All ten of the challenges are just super. Try one of them from each list and decide for yourself. Did you remember the name of the movie yet? It's Top Gun! That quote is from the very end of the movie! 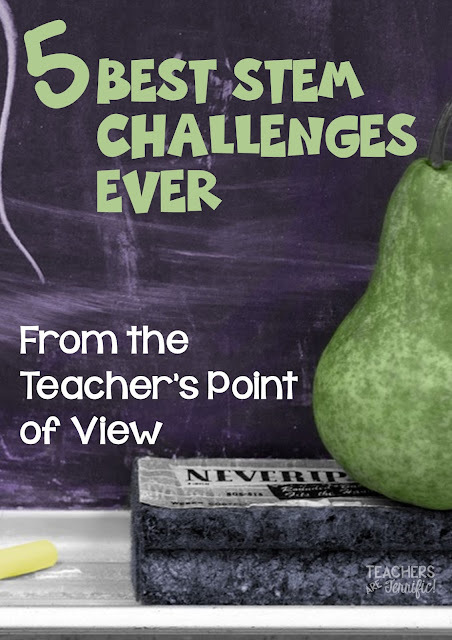 The best of the best easily describes the ten STEM challenges in this post! The cereal box and pipeline ones are great! I love all the different areas you can incorporate into one challenge even beyond science and math! I am really enjoying your blog! I teach a similar class and I am excited to try some of your ideas! Thanks so much Nicole! I am so glad you found my blog! I learn so much from other teachers and hope I can always share something of value! Do you have any more materials to share for your Pipelines activity? Hi Kristin! Pipelines is made of paper and tape, but the back story is quite spectacular. You can find it at my TpT store!